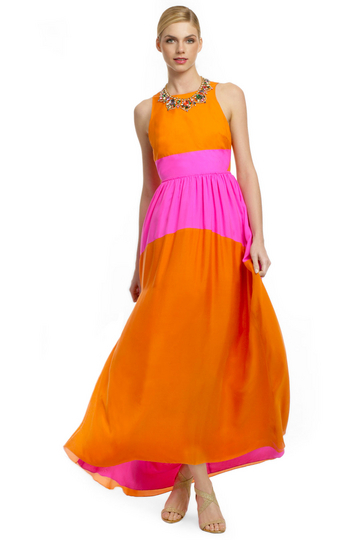 “I chose this maxi dress ‘Chatterbox’ by Tibi. It doesn’t require much effort and the cut is very flattering, also the color blocking can make you stand out in the crowd. I can wear this under my abaya and not feel so hot due to the weather. Every woman needs some sort of a maxi dress in her wardrobe, it’s very feminine and flirty, and can make anyone look fashion forward with the right choice of accessories. I especially love the cut in the back, it’s my favorite part of the dress!” – Maitha Al Maktoum, TRH founder. 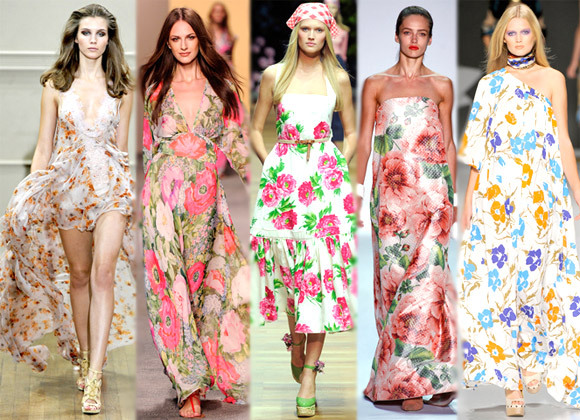 As for Sara Al Madani, TRH treasurer, she’s all for floral, flowy and comfortable summer dresses, weather short or long! “White button-up blouse! I have to confess, I’m not one of those fabulously fashionistas out there, just a simple regular girl whom occasionally have her Blair Waldorf moments. Saying that, I have chosen my summer item for this year and it’s one of H&M wonders, if I may say. Walks at the beach, simple friends gathering or doing your art assignment at 1am in the morning, it’s the shirt for the job.” – Hessa Al Amri, TRH member. So tell me dear viewers and readers, what is YOUR favorite fashion item this summer?! Our current competition that’s going on is about the statement Tweed Jacket. So we figured that it’s only relevant if we give you a brief background about how it emerged and why we are so in love with this significant piece of clothing. 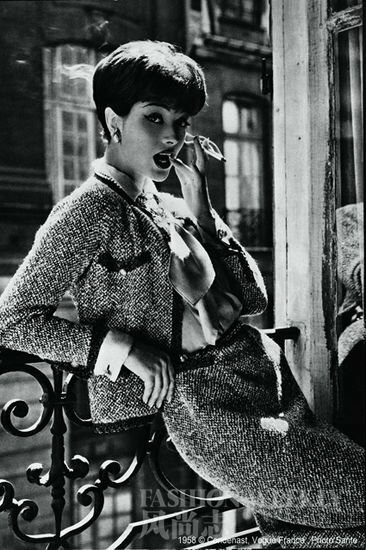 Tweed jackets are most common and known to us through the Chanel Haute Couture. However, Tweed developed back in the British Empire and was known among the small farmers and land laborers. Later on, tweed became more and more famous and the elite of the society got introduced to it. Because tweed is very hard to make, and only a few actually have the hands and the mechanic to make the statement jackets, it has become much more pricey and the crème de la crème were the ones who were famous for wearing it. This YouTube video is one of the most inspirational clips we’ve ever encountered. It’s about an old French lady that lives in the French Countryside and is known for making the best Tweed jackets and clothing in the world. Yes, Chanel works with her too. This lady has worked most of her life in this field, not to forget that she also takes care of her horses at the stables. The accuracy and precision in her work made her the most famous in this arena. Chanel has sent many workers over the years to learn how to make Tweed fabric but with no success it deemed far too complicated, but no one had the sleight in hands to get the pieces done so seamlessly. Keeping in mind that this woman, is in her eighty’s approx. it is very impressing how she is still going on with her life working and doing what she loves most: Tweed! Although the video is in german , we still think its one that will inspire any fashion designer out there. Tweed seems aristocratic but it does transfer a lot of history and heritage with it, and it once upon a time covered all classes just like the American Denim! This statement piece of clothing carries low-key sophistication but today, Chanel has managed to turn around the table and make it seem edgy, sophisticated and feminine all at once. With all the above being said, Chanel has always astonished us with their Jackets and clothing. Here is a quick preview on the whole process from inside Maison Chanel. The classic Chanel Tweed look. C‘est très chic! An example of Tweed colors and patterns that are used for different seasons. The fashionista and extremely elegant Olivia Palermo looks gorgeous in her Tweed jacket. We got more than a kick out of this awesome trend when Adele sported red under her nails that had everyone buzzing all the way to their beauty saloons. We know that the Grammys were way back now, when Adele waltzed in with a new trend in honor of its maker. However, since we spotted several numbers of girls here around University with Loubi nails, we just couldn’t let this fierce manicure trend go away without trying it. This look is actually very easy to achieve. I recommend using fake nails though, otherwise your red polish will be all over your skin but if you have long nails then that’s not a problem. To have the red bottoms, first you need bottoms– whether they’re natural and grown out, or done by a pro with acrylics. Coat the top with white to ensure either top or bottom color won’t show through the other side. If you don’t have a small polish brush, or don’t trust yourself to not make a mess, Apply tape where needed on your finger to solve that problem. 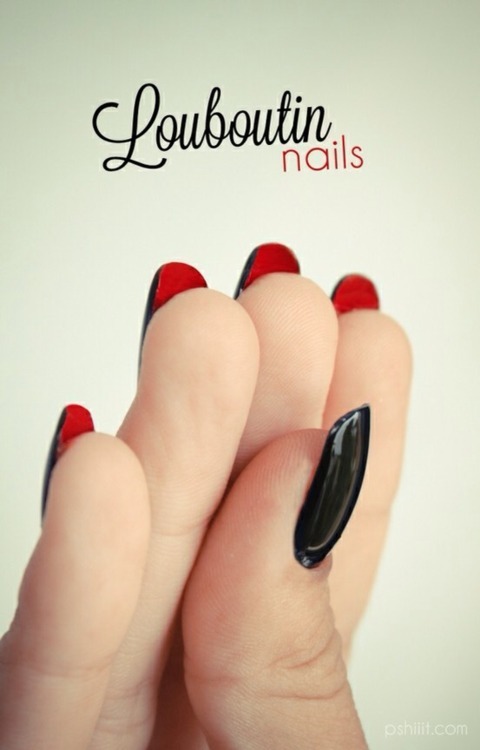 Apply any color that you wish to the top of your nail to get that classic Louboutin show-inspired nail.